That looks wonderful! 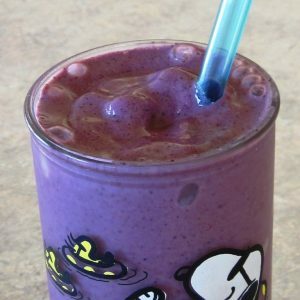 I do one with Cherry, frozen blueberries, vanilla kefir, a couple of ice cubes, and some pomegranite juice. I add a tablespoon of Spirulein vanilla protein shake mix and blend and it keeps me full until lunch time. Tina – whole milk? Wahoo! It's a step in the right direction. Thanks for thinking of linkin'. 😉 It's not like I want to go overboard with ads (that drives me nuts on some blogs), but if I can share something I like and earn a little bit, it's a good combo. That sounds like a good dose of extra healthy protein and fat. I finally got some good mango this year, and it was wonderful. I always thought I didn't like mango, but I hadn't had one that was properly ripened. Yep, ya wait 'til the mango weeps, then it's good to eat! In case you haven't seen a mango weeping, look at the stem end, right around the stem will be glossy sorta sticky fluid (small amts, we're not talking needing hankies, here). That's a weeping mango. Go forth and gobble! One of my personal favs for mangos is to blend (in my Vita, of course – yahoo, you are "one of us"!!) a mango with about a cup of kale or chard leaves or both, and about 1/2 c or so of water to make it go. It's geen for sure, but you only taste MANGO!! It's also known as Green Mango Pudding…thick and spoon worthy. Fun post – LOVED the intense purple – yum! I like mangoes, peaches, pineapple and berries all blended with milk kefir and yogurt. I have found that the probiotics complement each other as far as their action in my body. 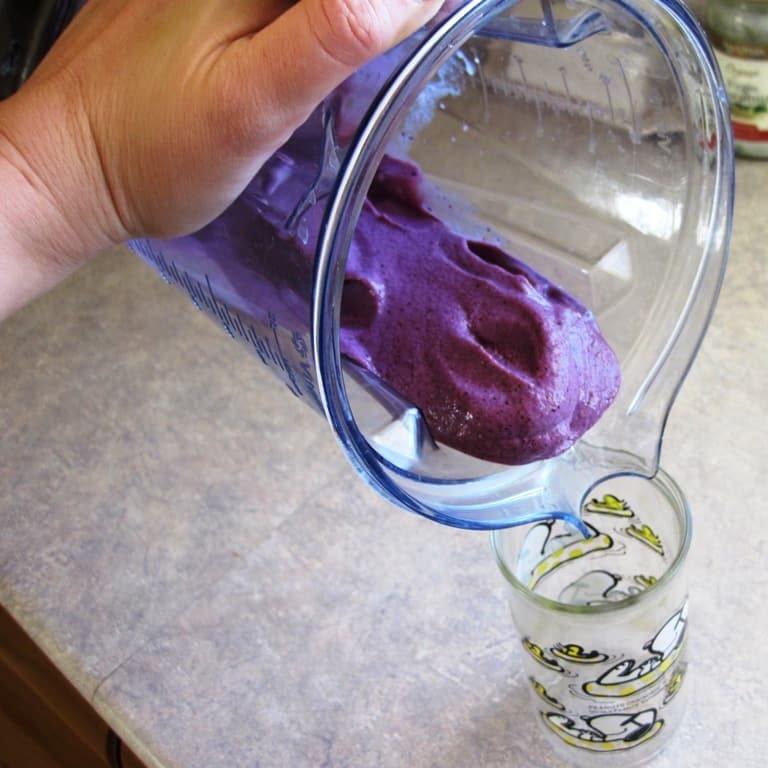 The yogurt makes the smoothie creamier. My grandkids like to use whole grain waffle strips to dunk into the smoothie. Healthy source of energy and delicious at the same time. Like dessert for breakfast. Speaking of which, raspberry and a bit of grated dark chocolate can make you almost feel guilt in a probiotic smoothie! CandyJane – I had noticed the droplets, but didn't know what to call them. The pudding sounds lovely. I still have some kale left in the freezer – hopefully enough to hold me over until the new greens start producing. bears – that sounds wonderfully tropical. 🙂 Sometimes I throw cacao nibs and cherries in my smoothies, ala "chocolate covered cherry:…mmmmmmm…. Sounds all fine, but what if someone like me who is allergic to all fresh fruits and vegetables, and nuts is supposed to use? Are there any alternatives, besides pills? Can you drink kombucha? No fruits, nuts or veggies in that, only tea, sugar and kombucha culture. What about coconut water or chia fresca? Been doing shakes for years. Teeth problems let us to this current recipe. Thanks.